Draft 1 - new ISTE Standards for Administrators released for feedback! 1. Draft 1 - new ISTE Standards for Administrators released for feedback! Hello All - Find a link to the first draft of the new ISTE Standards for Administrators and how to get involved in the refresh feedback process at iste.org/AdminRefresh! 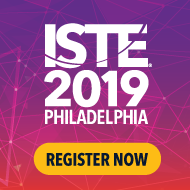 ISTE is seeking broad feedback from both leaders and educators in various roles. And please get your networks involved as well! 2. RE: Draft 1 - new ISTE Standards for Administrators released for feedback! Looking forward to looking at them and supporting this! Subject: Draft 1 - new ISTE Standards for Administrators released for feedback! 3. RE: Draft 1 - new ISTE Standards for Administrators released for feedback! ​I just completed my comments to Draft 1. Congratulations to those who worked to develop the document. It is very thorough and thought-provoking for the reviewer. Great work. Am looking forward to staying in the loop.